In Black Agenda Report (BAR), Margaret Kimberly trashes Angela Davis; she felt compelled to tear off from Angela’s chest all the medals the 1960s Left had awarded her, and declared her ‘Persona non Grata’ of the new zombie American Left. Angela’s big crime: supporting Hillary Clinton. Other ‘crimes’ committed by Angela, per the article, include her support for Obama in 2008. Funny thing is, the zombie Left, because they are unnatural brain-dead creatures, don’t remember that THEY were there with Angela rooting for Obama. True, BAR was one of the few who didn’t support Obama. But the rest of the American Left, and just about every Black progressive group and individuals, supported him, even the Communist Party. You see, you are allowed to commit those ‘mistakes’ as long as you don’t commit the mortal sin of supporting that woman, Hillary Clinton. You can support EVEN TRUMP, a billionaire elitist who supports the oligarchs and lies through his teeth. But you are not allowed to choose Hillary Clinton. Why? Well, the fact that she is a woman weight heavily in their hatred of her. The American Left in almost its totality attacked Hillary Clinton in the 2008 primaries with the same vengeance and hatred and misogyny they are doing today, when at that time there were no email scandals nor any of the crimes they attach to her today. Angela Davis was there with them too, but, for the zombie Left, nothing can redeem you if you don’t join them in their zombie world. 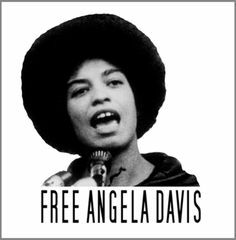 Today, the zombie Left is attacking Angela Davis as a whole person, nothing in her is worth anything anymore to these unnatural people. Denouncing Trump as racist and fascist is anathema to the zombie Left, and so they have declared Davis guilty of that ‘crime’. The past is forgotten, your good deeds are erased from history if you exercise on your own the power of your brain. Zombies, they envy the living people’s brain. The American Left has been a non entity since the 1970s. No one listens to them because they became inefficient, lazy and ideologically corrupt. Today’s millennials can’t relate to the American Left because it is a phantom in their lives; the Left have been forgotten because they made themselves IRRELEVANT. It is common knowledge that when the working class is considered defeated when the progress it made in the past with blood is taken away from them; that’s their situation today, defeated by the oligarchy and globalists. Rest assured, the Left is part of the reason for the slow defeat of the working class. Just like in Nazi Germany, when the Left could not stop bickering over who had the best interpretation of Marxism and allowed the Nazis to build a coalition with the military elite and corporations; the working class had nothing to protect them from the excellent Nazi propaganda machinery and their powerful coalition. The leftists were staring at their navel. The rest is history. Today, the absence of an ideologically honest Left, capable of assessing their strength and weakness to engage in coalitions with the Dem party and other groups, is one of the reasons the working class supports Trump, but not the Left which have been talking about globalism for years. The American working class has no one to support its interests in the Left. The Left is compose of pseudo-intellectuals who will support Trump if he wins. This blog is about the zombie Left, about how they became zombies the day they ate the Trump ‘anti-globalism’ lie. UPDATE: The American left is supporting Trump after the elections. See my recent posts about that. Shame on them.